These photos were taken by Vic Ramos, a photographer in Miami, FL in November 1997 for Knight-Ridder Inc.'s company brochure. 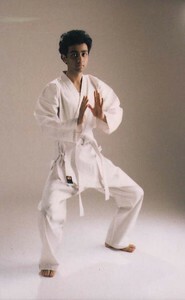 I've practised martial arts off and on since I was a little kid. 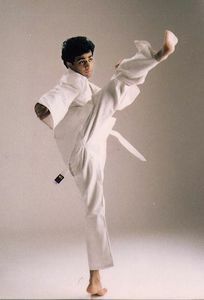 I learnt Shotokan Karate combined with some Kung Fu for another few years followed by Tae-Kwon-Do for a few years. I've also tried to learn about some other styles on my own. 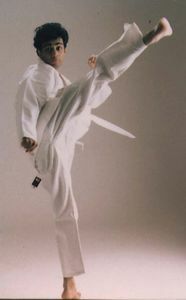 I'm a peaceful human; I practise martial arts more for their arts value than for their martial value. "Look at the camera when you kick." 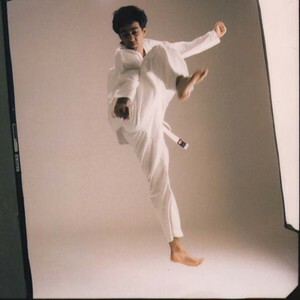 This one was snapped a moment after the jump kick was complete so it looks a little awkward. The photographer took several good photos of different jumping kicks, but this is the only one I have. Stances and breathing excercises are an essential part of training.